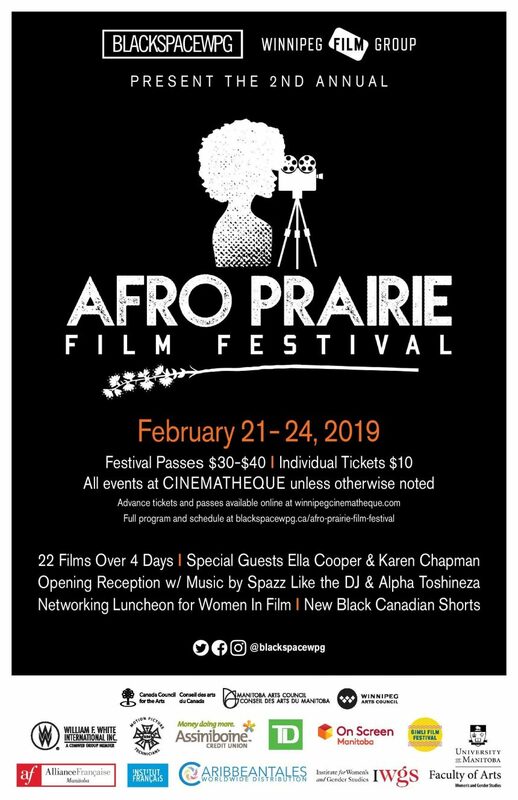 Black Space Win­nipeg in part­ner­ship with the Win­nipeg Film Group is proud to present the Sec­ond Annu­al 2019 Afro Prairie Film Fes­ti­val in cel­e­bra­tion of Black His­to­ry Month, from Feb­ru­ary 21 – 24, 2019 at Win­nipeg Cin­e­math­eque (100 Arthur St.). The Afro Prairie Film Fes­ti­val is the first Black film fes­ti­val in the prairie region of Cana­da. This four day fes­ti­val cel­e­brates Black cin­e­ma across North Amer­i­ca and pro­motes the work of estab­lished and emerg­ing Black film­mak­ers from right here in Man­i­to­ba. Par­tic­i­pants can look for­ward to a week­end filled with pro­gram­ming that explores Black nar­ra­tives in filmmaking.